High quality 320D waterproof nylon filled with 100g/㎡ Silk-like Cotton make the sleeping bag cozy, comfortable, waterproof and wet-proof. 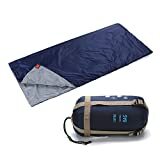 This Sleeping Bag is great for summer and warm weather camping. Lightweight zipper design, you can use it as a quilt in air condition. Space-saving, portable, it can be compressed to quite small volume with light weight. Ideal for more than 5 years old children and adults. Last Promotion Before Christmas!!! Come to prepare for the next spring and summer. This sleeping bag is designed for warm weather, which is perfect for the summer months. Note: Two sleeping bags can be zippered together, then it fits two person.